If we were as impatient about gardening as we are investing: Sam plants some seeds in his backyard. He checks back four hours later. Nothing. He digs them up and replants them. Four hours. Still nothing. A week later he is dismayed that he has no oak trees in his backyard. He calls oak trees a scam. As Homer Simpson says, "It's funny 'cause it's true." Shoulda thrown in the towel. 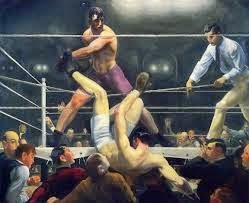 George Bellows' "Dempsey & Firpo"
It's equally irrational, however, to plant some seeds in the backyard, check back a decade later, see nothing sprouting from the ground, yet conclude an oak tree will eventually emerge. Something went wrong. At some point between the two extremes - four hours and a decade - it makes sense to throw in the towel on a stock that isn't performing and reinvest the capital elsewhere. But how do we determine the right time? Whether I have been successful in the first year or unsuccessful can be as much a matter of luck as anything else...If I have a deep conviction about a stock that has not performed by the end of three years, I will sell it. If this same stock has performed worse rather than better than the market for a year or two, I won't like it. However, assuming that nothing has happened to change my original view of the company, I will continue to hold it for three years. While I much prefer a five-year test, I feel three years is an absolute minimum for judging performance...If any three-year or longer period produces poor results, we all should start looking for other places to have our money. Three years seems like the right amount of time to give the market a chance to come around to your thesis. If that hasn't happened by the three year mark, your thesis was probably wrong. There's something to be said for taking the "coffee can" approach -- investing in a stock and then checking back on it many decades later. Fidelity reportedly ran a study, for instance, that found the group of its clients who had the best performance were those who forgot they had accounts at Fidelity. If given the choice of doing nothing or trading my portfolio every month, I'd choose the do nothing approach. In practice, the ideal strategy is found somewhere in the middle. The key is that your decision-making rules are long term in nature and are approached with a patient, business-owner's mindset. A three-year rule for throwing in the towel on a poor investment is one such rule that we'd do well to implement in our process. This is the last Clear Eyes Investing post of 2014. Thank you very much for reading this year. Hoping you have a wonderful holiday season! When Should You Sell a Good Stock? A few years back, my wife and I were shopping around for a leather couch to put in our new home. As we walked around the showroom of a furniture store and had a look at some of the price tags for the couches, however, I realized our bank account would end up being a little lighter than I expected. Real leather couches don't come cheap. Never eager to spend large amounts of money, my attention quickly turned to the faux leather options. Much to my delight, these were much cheaper. For a fraction of the price of a real leather couch, we could get the same size and design. And besides, I reasoned, visitors wouldn't be able to tell the difference anyway. Why spend the extra money? It seemed like a sweet deal at the time, but things have changed. Today, my "deep value" couch is falling apart -- literally -- and I find myself back in the market for a new couch. Had I originally paid up for a high-quality leather couch, I probably wouldn't be in my current predicament. The poor man pays twice, indeed. My mistake was this -- I only considered the price of the faux leather couch relative to the real leather couch without considering the prices relative to their respective quality. As investors looking to buy stocks on the cheap, we often fall into the same trap -- we erroneously think a company with a lower multiple presents a better deal than one with a high multiple. While that may hold true when we're comparing two identical assets, the rule breaks down when we're comparing assets of different quality. While the market isn't perfectly efficient, it is generally efficient, so more times than not tomorrow's great companies won't be found using a low price/earnings screen. If you want a chance to own a few of tomorrow's great companies, then, you'll need to eliminate your aversion to paying premium multiples. As you might deduce from my story about couch shopping, this is something I've struggled with in my own portfolio. On a number of occasions, I've had a case of sticker shock and balked at investing in promising companies only to watch those stocks push higher as their competitive advantages, pricing power, and earnings growth more than justified their premium prices. The risk with buying premium-multiple stocks is that today's premium-multiple will be tomorrow's average-multiple and your returns will be decimated by a re-rating. Reversion to the mean is a powerful force, of course. As with any investment, it's critical to get a feel for the market's current expectations for the company and weigh them against your own. Equally important is the ability to tell the difference between a great company from an average company. If you're confident in your evaluation of both factors, you shouldn't shrink from paying up for quality stocks. Zone of Competence | Dollars, Sense, and Probabilities. Copyright © 2012-2016 The W8 Group, LLC. All rights reserved. Awesome Inc. theme. Powered by Blogger.